AR: Santo Domingo City Hall "Completely Broke"
Santo Domingo City Hall "Completely Broke"
The fastest-growing economy in Latin America is in the news again, this time for gross mismanagement of its finances. David Collado, the new Mayor of Santo Domingo, reported that the city's finances were in complete disarray, and that 43 million dollars were unaccounted for. 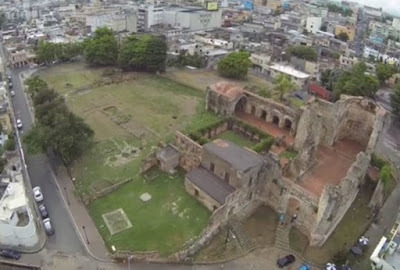 The former Mayor of Santo Domingo, Roberto Salcedo, failed to pay the city's tax bill, according to Mr. Collado, with the revelation of the crisis facing the oldest European settlement in the Americas coming only with the unprecedented loss of the city by the PLD during the elections this year. There is now rampant suspicion that other city halls throughout the country could also be hiding staggering amounts of debt, with the ruling party thought to be "cooking the books" for the entire country. According to the digital portal AlMomento, Mr. Collado reported that "bills keep coming in," and that he is not even certain of all the details surrounding the large debt left by his predecessor. So far, Mr. Salcedo has remained completely silent as to the financial status in which he left the capital of the Dominican Republic, seemingly having disappeared from the public limelight, something no one expected from the publicity-seeking former TV talk show host. Mr. Collado reported that the difficult situation which he has inherited means that the Santo Domingo City Hall will be forced to borrow millions of dollars on short notice just to pay its staff. The city will also be forced to perform a staff audit at the end of this month in order to determine which employees are redundant, leading to fears that many people could lose their jobs. The latest revelations about the dismal state of Santo Domingo's finances have already sent the populace into a fury, with many internet commentators demanding that the government bring criminal charges against someone in the former administration.